I love this chart because it exactly matches my sentiment. I have been buying TIPS since the late 1990s and while I suspected then that those near- or plus-4% rates were a good investment, who knew then they were so FABULOUS? They were. If you examine the chart, you can see there was a great buying opportunity to grab TIPS in late 2008 (an excellent time to buy TIPS mutual funds) and even in early 2011 prices approached Grannis’s ‘fair value.’ Right now, though, TIPS are solidly in the ‘expensive’ range and seemingly not very attractive. 10-year TIPS are trading at a real yield of almost zero because the market fears that the outlook for economic growth is absolutely dismal. But buyers of TIPS and Treasuries today have almost no doubt that inflation will be about 2% per year for the foreseeable future. 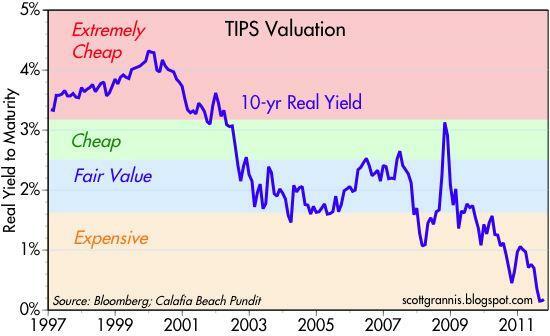 Put another way, if you worry about deflation, then you will shun TIPS and prefer Treasuries instead. … If you expect the economy to have even the slightest chance of growing in the years to come, then you will find both TIPS and Treasuries to be very unattractive. If you expect the economy to eke out at least some degree of growth and if you expect inflation to rise, then you had better be prepared to see TIPS prices fall. A very nice analysis that I happen to agree with. Check it out.